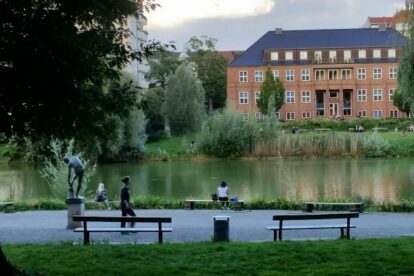 Lietzenseepark – A close getaway! The Lietzensee lake was originally the fish pond where the nuns of the Benedictine convent of St. Marien in Berlin went out to get some fresh air from their long and tedious times of reclusion and where they looked for the answers to their prayers, either by fishing or taking a walk in this haven of peace. Unfortunately, no fish survived but you can see some ducks, rabbits, squirrels, foxes and of course, the crows. There are 4 playgrounds for kids, with a sandbox and different themes, a lot of space for picnics, for walking the pets and for summer games (and some winter ones if the weather allows it), feeding the ducks and sunbathing (… if it gets sunny), far away from the maddening crowd. But unfortunately you can’t swim in the lake. The park is split in two by the Kantstraße, but there’s a pedestrian tunnel to cross from one side to the other under the bridge. In the southwest half, there’s a boathouse that is a café and beer garden, the Bootshaus Stella am Lietzensee. Spring is already here, but winter resists to leave us completely, but you can still get enraptured by its colors. I go with my biggest kid to the playground that is in the south-west bank, close to the Herbartstraße and Dernburgstraße corner, because is less crowded and there’s a toboggan shaped like a plane with a pilot’s cabin.